What do I have to say about the E-Mihi G50? Well, for starters, it’s one of the best gaming mice I’ve come across in the past year. The futuristic and stylish design doesn’t sacrifice quality for looks. One thing that should be noted is that the E-Mihi can only be programmed on Windows OS. If you are using Mac OS, then you should make sure you have a way to program the mouse on a Windows OS computer, otherwise you will have no way to use the E-Mihi on a Mac. The software installs automatically with the mini disc that comes with the E-Mihi G50. You have the option to customize all of your programmable buttons. You can also set up your DPI settings, which can be locked down to a button on the mouse as well as synced with the LED lights. The software can also be used to assign programmable features to the Precision Aim button and to execute macro and key binding commands. Although I did not experience any problems with the software, some reviewers report faulty software errors that make it difficult to adjust the DPI settings. 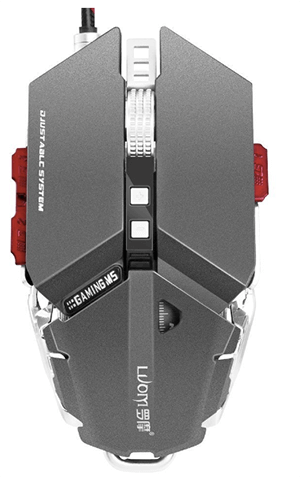 The E-Mihi G50 is a “mechanical gaming mouse” with aeronautic titanium alloy materials and a durable mechanical feel. The mouse cable is built from a 20-core braided line, which is highly durable and resistant to snags and tangles. 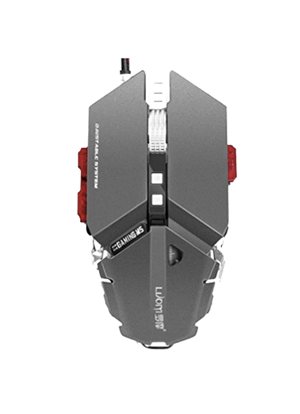 The symmetrical design of the mouse adds to its mechanical and industrial look. That said, the mouse maintains a good balance between simplicity and complexity in design. To top it off, the mouse’s plastic and steel materials make it a truly durable accessory. To my surprise, the E-Mihi G50 handles extremely well. 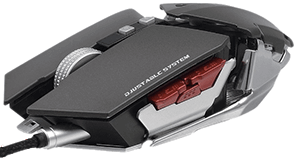 It’s a comfortable mouse with the ability to suit all types of hands and grip styles. There are a couple of things that make the E-Mihi G50 more than just a typical good looking mouse. For one, it has a built-in six angle wrench which can be used to remove the plate covers and choose from three different palm rest sizes to suit your needs. Even after the claw- and palm- grip, I found it to be delightfully comforting and easy to use. However, some reviewers say that the mouse is too large for their hands. In this regard, the adjustable palm rest will do you no favors. For me, I found the size to be adequate and dependable. Proceed with caution if you prefer to use a smaller mouse. Although adjusting the mouse is not something you will want to do frequently, as it requires you to remove the mouse plates, I find this to be one more reason to love the E-Mihi G50 for its versatility. The Max DPI is 4000 which some may find a little low, but for now, it does what I need it to and I have no complaints. You can adjust DPI to 500, 1250, 2000, and 3500 without drive. The mouse is packed with an optical sensor. The mouse can move at either low or fast speeds and responds with on screen exacting accuracy. The E-Mihi G50 has a polling rate of 125-1000MHz in addition to a 50G acceleration rate. Overall, the optical Avago sensor is nothing special, but it does the job and delivers speed and accuracy no matter what level of gamer you may be. The mouse’s ten programmable buttons have a nice click noise when pushed. They aren’t too loud or too quiet. I had no troubles with the button placement during my review of the mouse. Actually, I found it to be one of the more sophisticated mice in this regard because they’re easy to find and use as well as durable and useful. If you consider yourself a serious gamer, then you will certainly make use of all ten programmable buttons. Overall, after using the mouse in a game of Final Fantasy 7 and Diablo 1, I found the E-Mihi G50 to be a superior gaming mouse in terms of design, comfort, and speed. However, you should still be aware of the potential drawbacks of using the E-Mihi G50, such as its rather large size for a gaming mouse and its software which is limited to use on Windows OS.